Have you ever had a great chair that got its upholstery ruined after continuous use? 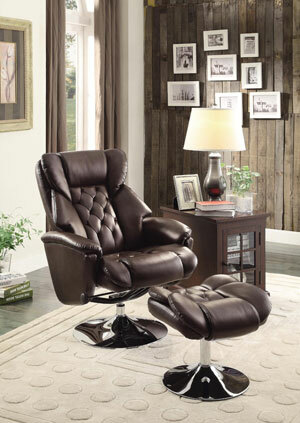 Or have you found the perfect comfortable recliner, but the upholstery doesn’t suit your taste? There’s no need to fret in the future if you find yourself in either of these situations. 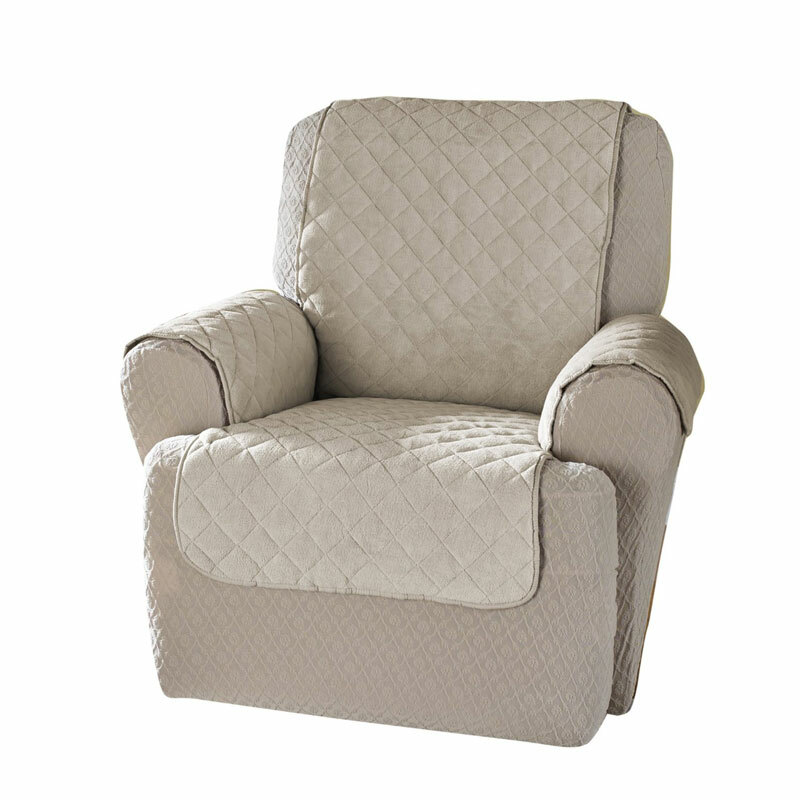 Recliner covers provide a way for you to protect your recliner’s upholstery, and also a way for you to adapt the style of your chair if you wish. There are a couple different types of recliner covers to choose from depending on your preference and needs. One type is a furniture cover, which provides partial coverage of your recliner. These cover the back, seat, and arms of a chair rather than enveloping the whole chair. This style is more suitable for loungers who simply wish to protect the upholstery of their chairs. The other common style is a slipcover, which completely cover the chair. 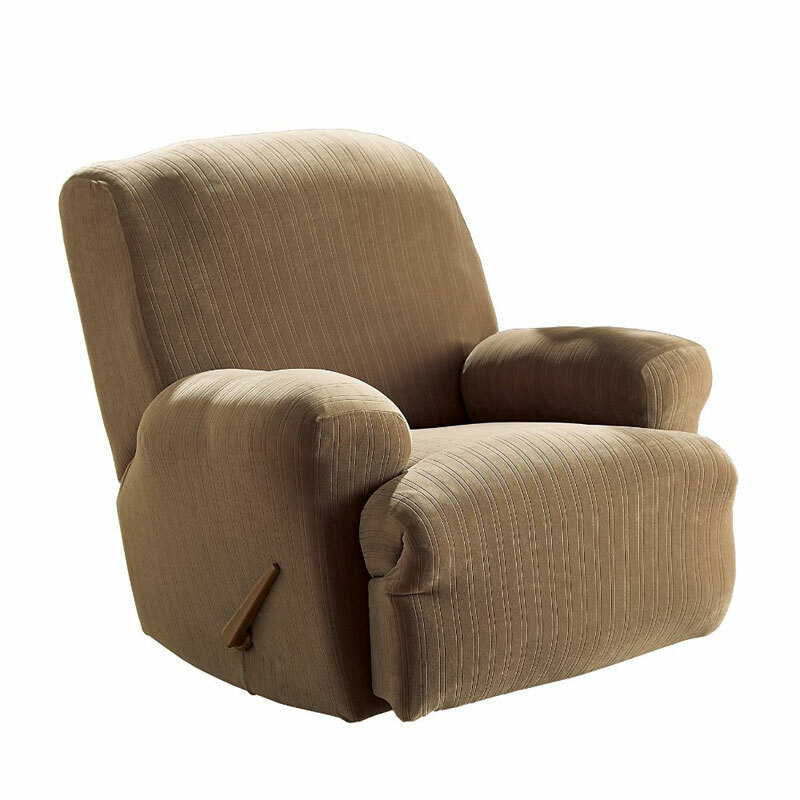 Recliner slipcovers typically consist of multiple pieces so that each piece can easily be fitted over the four main parts of the recliner, though some are one piece. This option offers protection for the upholstery of the entire chair, and also allows for aesthetic change to a person’s taste. 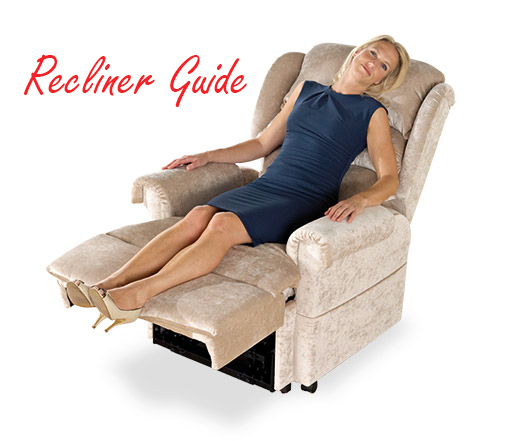 Check out our article with tips on choosing a good recliner cover if you need more guidance. Lets go over a few crowd-favorite recliner covers so you can compare the styles and consider which may work best for your needs. The Sure Fit Stretch Pinstripe Recliner Slipcover is made of polyester and spandex with an elastic bottom to contour to your recliner. This cover is a single piece. It features a hole for a right side handle, a left left side pocket compartment, and a fit made for a continuous footrest. 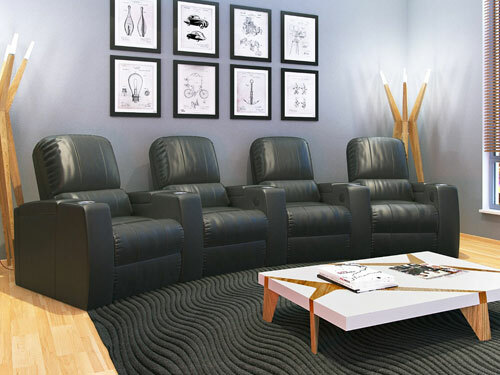 It will best fit recliners that have a 78″ to 88″ back circumference. Five color choices are available for this cover, giving buyers the choice between Black, Cream, Chocolate, Taupe, and French Blue. The fabric also features a subtle pinstripe pattern to add a little more visual interest to the design. 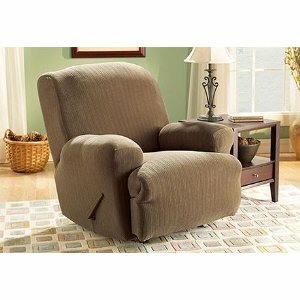 The Stretch Sensations Optic Recliner Stretch Slipcover is a polyester-spandex blend. It comes in four colors — Chocolate, Gray, and Sage. The fabric features a subtle motif and is machine washable. This cover features an opening for recliner levers plus a convenient side pocket. There have been complaints that this cover’s material does not stand up to tough wear and tear, so this may not be the best fit if it’s going to be covering a chair that sees a lot of action. 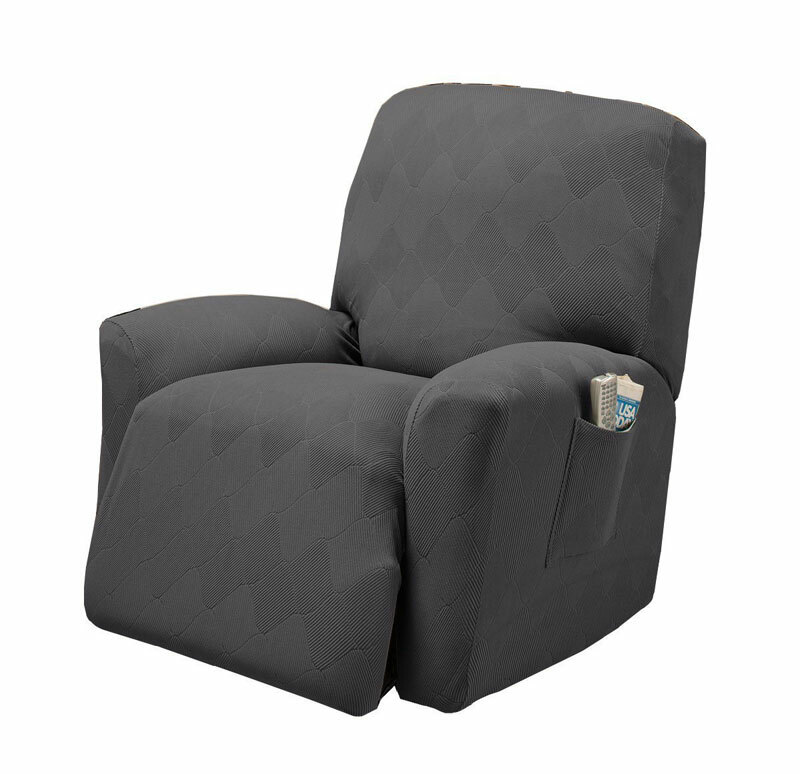 The Innovative Textile Solutions Plush Wing Recliner Protector is a padded recliner cover featuring a 4″ box quilt stitch. As you can see, this cover simply protects the parts of the recliner that see the most wear — the back, seat, and arms. It is made of machine-washable polyester and comes in Chocolate, Cream, and Olive. It is all one piece and features flaps that tuck into the seat cushion to help keep it in place. However, this flap does not secure the back portion of the cover and users report that the back panel can easily slip down. 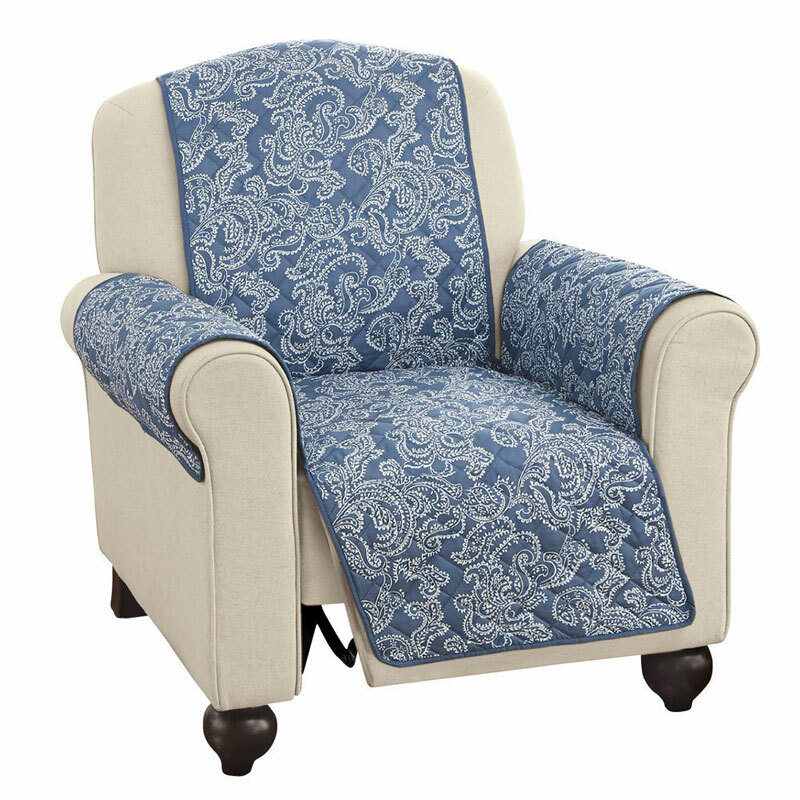 The Collections Etc Paisley Reversible Furniture Protector is in a sassy class of recliner covers. Made of quilted polyester, it comes in Blue, Sage, and Chocolate. It’s a reversible cover, with one side featuring a white paisley pattern and the other side just the solid base color. This is great for those who like to mix up their home decor as giving your recliner a new look is as simple as flipping the cover over. 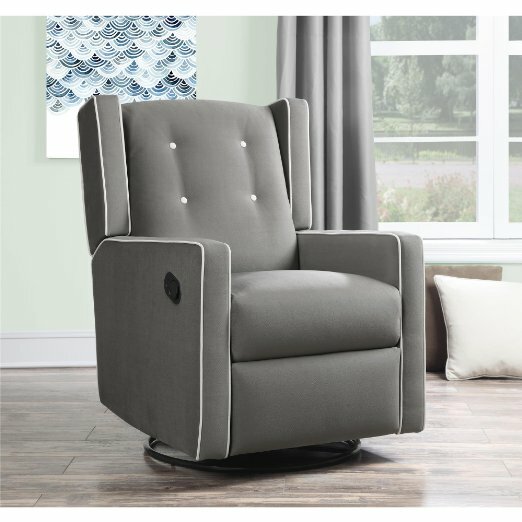 Like the other highlighted recliner covers, this one is also machine washable.